I have been eagerly looking forward to this series since it was announced, building up my expectations to a level that could not possibly be achieved. Therefore, before reading this comic I made sure to tell myself to just expect something good. Needless to say, this comic did definitely deliver on a fun time. 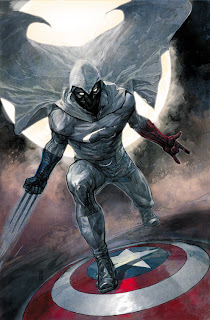 Marc Spector has sold his story about how he became Moon Knight to television and is out living in Los Angeles, when some of his Avenger friends come to him and ask him to figure out which villains are starting to set up shop on the West Coast. 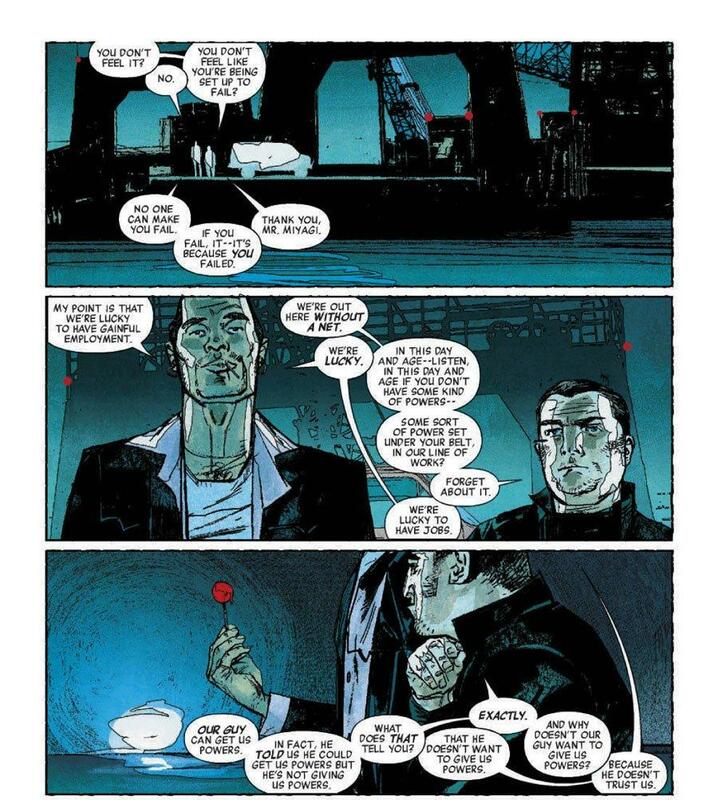 What follows is some good dialogue between mafia toughs, a well-illustrated fight scene, and a mysterious kingpin we don't see causing trouble. Yeah, nothing too amazing, basically just a fun action comic that could star any hero...until that awesome last page reveal that could only work with someone like Moon Knight. 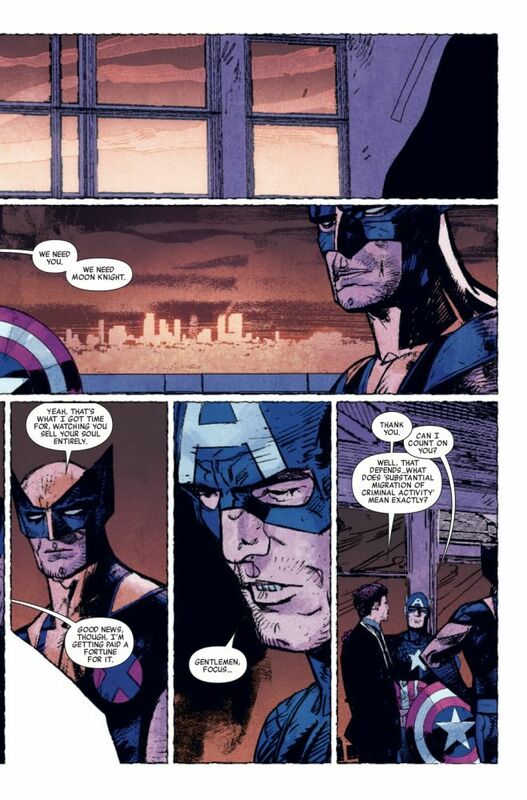 Bendis, I knew you would bring some of that "Daredevil" magic to this comic. That last page makes you have to look over the whole comic again and review everything to figure out just what you can trust. I won't spoil it, but I will warn you to keep in mind this is Moon Knight we're dealing with, and he's always been one crazy mofo. The art is also darn pretty too, with Alex Maleev using a slightly sketchier style for this book, which works just fine for me because when he gets too hyper-photo-realistic I can get a bit turned off. Perhaps the fight scene is dragged out a bit, and that reveal could have happened a bit sooner, but this was still a great time. I love Moon Knight, ever since checking out Huston's run on the character and then going back to his earliest appearances in those fat "Marvel Essentials" books. That means that as this is a different direction Bendis is taking him in, I theoretically should throw a hissy-fit, but I won't, because I can see what Bendis is doing as a natural evolution of Moon Knight as a character--and as a man suffering from borderline-psychosis. I look forward to what comes next and whatever trouble could be brewing.